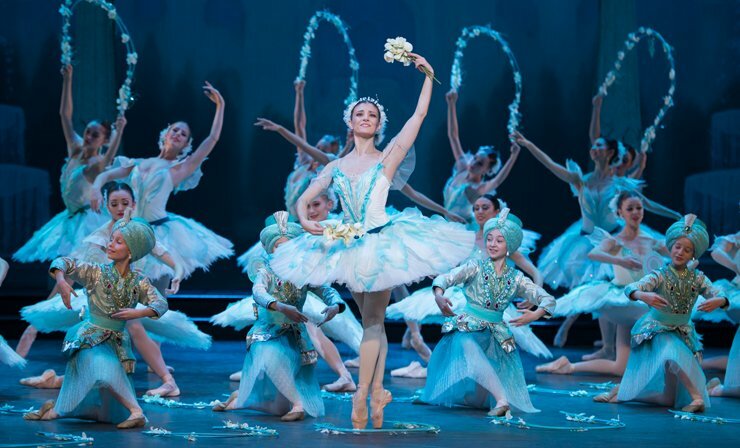 The spectacular swash-buckling tale of Le Corsaire (the pirate) sensationally showcases English National Ballet’s incredible dancers in sparkling tutus and costumes set against a sumptuous and rich backdrop. Tamara Rojo CBE starred as Medora on opening night, with Osiel Gouneo as Conrad, the pirate who saves his beloved Medora. Osiel was utterly spectacular, and his performance loved by the audience. His pirouettes were so numerous that you often held your breath in awe of the execution, but each set was perfectly landed. Cesar Corrales as Ali wowed the audience with a series of complex leaps that appeared to suspend in mid-air. Cesar has lovely arabesques, he’s so flexible, dances with grace and is wonderfully musical. Every time he appeared Cesar set the stage on fire. The audience repaid his spectacular performance with a roaring ovation. Laurretta Summerscales as Gulnare was simply divine in a white tutu with her quick movements, beautiful lines, perfect pointe work and multiple pirouettes. She danced with real joy, so confident and full of emotion and with some lovely moments of humour. An absolutely stunning performance. Of course the inspiring Tamara Rojo CBE was beautiful and loved so much by the audience. There was electricity throughout the theatre when she stepped onto the stage. Tamara is so elegantly regal with such a strong presence, you just can’t take your eyes off her. Le Corsaire is a thoroughly enjoyable ballet, that brings out the best of the dancers and especially elevates the male dancers with Yonah Acosta and Brooklyn Mack also giving outstanding performances and were dazzling. The entire cast was on fire on opening night! This is a ballet that the entire family can enjoy, it’s stunning to watch, it’s funny, there’s wonderful characters, it’s a true jewel encrusted spectacular! So for a great night out, get your Le Corsaire now! The spectacular swash-buckling tale of Le Corsaire (the pirate) sensationally showcases English National Ballet's incredible dancers.